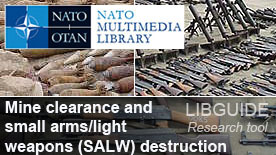 This LibGuide is intended to provide a few starting points to assist you with your research on issues related to mine clearance and small arms/light weapons (SALW) destruction. "NATO is committed to the implementation of international agreements and standards and to support Allies and Partners in fulfilling their obligations. Implementation of the UN Programme of Action on small arms and light weapons (UN PoA) provisions has to be integrated in a comprehensive and multidimensional approach in order to provide sustainable and long term results. NATO is also committed to multilateral cooperation within the NATO, EAPC, MD, and ICI as well as other multinational formats. In this respect, NATO has the ability to complement and support UN initiatives and activities with technical and military expertise. NATO Small Arms and Light Weapons (SALW) & Mine Action (MA) Portal. In January 1999, NATO established the Ad Hoc Working Group on SALW, within the framework of the EAPC. Later that year, work began on creating the NATO/PfP Trust Fund Mechanism, which has become an integral part of the Working Group ever since. In 2004, the Working Group’s mandate was expanded to include mine action issues, renaming it to the Ad Hoc Working Group on SALW and Mine Action. The Working Group’s authority comes directly from the Euro-Atlantic Partnership Council (EAPC) itself.